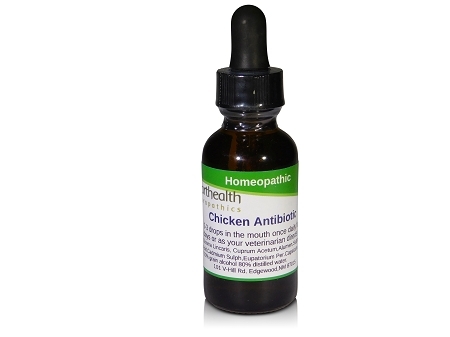 Natural Chicken Antibiotic. Homeopathic Liquid Spray.10% Safe For Chicks And Chickens. Spray directly into the chicken's mouth 3 time every other day or use a small container that holds about 4-5 ounces of water,(use lukewarm water) spray about 8-10 sprays and let specific chickens or let all of your chickens drink from it ,make sure you take their primary drinking water away. Active ingredients: Eupatorium Per,Cadmium Sulph,Diosma Lincaris, Capsicum, Cuprum Ace,Alumen,Sulph Acid Inactive ingredients: 20% grain alcohol 80% Distilled water. Equine Strangles Formula. All Natural Oral Homeopathic Spray.